Warcraft 3 Advanced Video Settings Configurator is a small program for Warcraft 3 graphics settings developed by NoobHacker. It allows you to set your Warcraft 3 Video/Graphics settings without launching the game. Also, Warcraft 3 officially does not support Wide-screen monitors, this program can be used to set widescreen resolutions without entering Windows Registry Editor. • Change Warcraft 3 Graphic Settings. 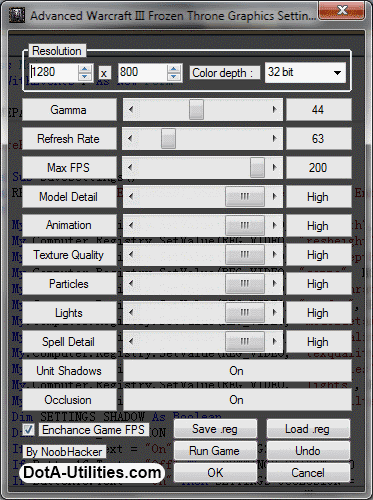 • Modify Warcraft 3 video resolutions and color depth. 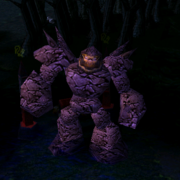 Tip: If your Warcraft 3 is taking 1-2 seconds to switch windows (ALT+TAB), make sure that your Windows Desktop resolution, color depth and Monitor Refresh rate is matching Warcraft 3 Color Depth, Resolution and Refresh rate. If both values match with each other you can switch between your Warcraft 3 & Desktop faster. how can I view my current FPS in warcraft 3? @ 10:45 AM - You don't need to use Fraps to view FPS, just enter "/fps" command in game. what is the main purpose of this program ? y dont we just open warcraft and change the 'video' option ? It looks ugly in widescreen 1080p looks so stretched and pixelated. Maybe you did not set the refresh rate correctly that's why the resolution was not applied. I run at 1680x1050 and it looks great. The aspect ratio is not adjusted so the screen would be stretched. can someone tell wtf is fps? y my mouse dot delay "? IF YOU WANT TO ALT+TAB Faster just bring the game video brightness down to 0/1 (the lowest) for fast alt+tab response ;) , hope i'v helped someone. that is all! :)dota is the best game ever! where can i see my fps?? wgt does my mouse is delay?? and it is so slow..can anyone help me. mouse delay because your computer don't have enough spec to run that video config so it lags. hey can you post a video on how to use it? I can post a video! ic cant use it .. dont know how to ..
can this fix the directx issues?? woa man...I was never able to turn on v-sync ( up to 60 fps), I remenber playing it at 64 fps which causes screen tearing, but with this I can get awesome 60 fps! !...Sir, you have my gratitude!! !